Turtle Moon Studios. Susan Shie. Turtle Trax 7-7-00. You can jump ahead to Page Two, if you like. Hey, we're ready to blast off to teach at CraftSummer at Miami University two days from now! What a wonderful class that's going to be! We can count on our students at Miami of Ohio to be really hardworking, fun, and supportive!!! And we already know and love most of this week's other teachers. Check out their work! Last time I had to cut the diary for May 8 off early, because Tilly (my computer) was too sick to do any more image files. So this diary is going to be a very big one, on two pages, going back to Easter, when my sister Debi and I held a hat-making and egg-coloring party here for our nieces, nephews, and great-nephews! You can see part of us here in the kitchen, late night, modelling our fabulous hat creations! Jimmy, Debi, and her son Matthew are all absent from this shot, but they had groovy hats, too! Omari, in Aimee's arms, was the Easter Lambie. Behind them are me, Jacob, aka Blue Boy, his and Aimee's sister Sharon, holding her baby Julian, and her other two sons, Donovan and DeVante, aka Car Eye. Considering that the massive projects of dyeing eggs and eating copious amounts of Easter candy happened before this event, we can only conclude that caffeine has a strong effect on artists of all ages! Too bad Dad wasn't still alive and living here! This "commotion" woulda been enough to make a preacher swear, he would have said!!!! This is my little sister Debi Ondrik, in her lovely Easter Bonnet! She worked really hard to get this party together for the kids, and it was a great success! Those of us who are older, including Aimee, Sharon, and Jacob, got a bang out of doing the oldtime dyeing mess all over again with the new generation! Debi and I reminisced about how our one brother, Jimmy Shie, always insisted on hogging the purple dye a long time, wanting to make the very purplest egg in the house. And then bragging about how very ... purple ... it was! Much more purple, and quite superior to our miserable less purple eggs! After the Easter happening, Jimmy and I took off to teach at Lake Tahoe, for Leslie Gelber's Beyond the Surface Symposium of fiber and wearable art. Here we are the morning after our cross country flights, having made our way to Tahoe City, where you could really get right down to the water of Lake Tahoe. From the conference center on the mountain, where we were staying and teaching, you couldn't even see the lake, so we were very happy that we had made this trek before classes started. Kerr Grabowski, who was teaching a class, too, went along, and the three of us had a fine time, exploring the local village! Here is our class of Outsider Art Quilters, at Beyond the Surface. We made them all do deep breathing relaxation exercises before we took this shot! Actually, Bob Gelber took the shot, doing his best to act like a strict father figure. You can see all our reactions to Father, as we behaved ourselves a little while! This really was a magical group, full of fun and daring! We had a three day class, nestled on the mountainside, with gigantic pines and exotic varieties of bluejays and woodpeckers, particular to that region of the country. It was glorious! Here is Leslie, when she stopped in at our class one day, wearing one of her original creations, as usual. Leslie is a very good wearable art artist, besides being a great facilitator! She had taken last year's conference t-shirts and made an outfit from them. This is a self portrait, I think, using the t-shirt's silkscreened motif as a pillbox hat! Very nice! I enjoyed seeing what Leslie would show up in each day, while I slopped around in my ugly but comfortable duds. It was the kind of weather you couldn't plan much for, except by layering, which we all did, in our various ways of coping! But Leslie's layers were the best!!! After this wonderful symposium, Leslie and Bob shipped us off to Reno, where we'd make our plane connections to various homes. Among Kerr, Glenys, Jimmy, and me, none of us had ever used a slot machine before! Babes in the woods, we were! Kerr lost two bucks to a computerized machine, before we realized none of us could figure that thing out. So then we moved on to the good old One Armed Bandits! I think Jimmy and I lost two fifty! Two DOLLARS and FIFTY CENTS, that is! We were able to stretch our gambling jag over maybe a whole half hour, being given a few quarters back by the machine, every time we said we were done, if this time didn't do it! Jingle, jingle, jingle! Holding on by a thread! We all laughed so hard, you'd think we were drunk, but we were stone sober! I juried two national shows for this year. On May 6 and 7, we went down to The Aullwood Audubon Center in Dayton, to open the show "The Good Earth," the show put together by Aullwood and The Miami Valley Art Quilt Network. This was their eighth yearly show, April 22 to May 30. Sharon Weltner, standing here between us, was the person in charge of the show, who had done most of the work to announce the national competition, promote the show, and orchestrate my jurying. She is one special woman! She was very organized about how the jurying was accomplished, and it helped me to do my job a lot easier! Plus she was easy going and fun! We're standing in front of a door that's hand made by an artist! It's trees. The branches define the panes of glass' shapes and it's really amazing! Plus there is a second door like it! This is the new building Aullwood has just completed! The doors above are just part of the wonderful architecture of the place! Our quilt show was the first art exhibition in the new building, and it was great to go around and enjoy seeing the quilts there, in a space built by dedication and hard work on the part of many naturalists, who have sustained their efforts for this organization, without government aid, for a long time now! The center is built in the midst of many acres of sanctuary land, a perfect place to preserve natural habitats for many animal and plant species. 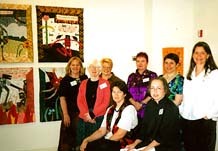 In the photo above are some of the quilts in this special show, including on the bottom right wall, pieces by Deborah Fell and Caryl Bryer Fallert. I think having a theme, "The Good Earth," to which I was to pay strong attention in jurying the quilts, made it become a very cohesive exhibition. I was given a full artist's statement for each piece, which was read to me, as I studied the slides. Since I love both narrative quilts and environmental quilts in particular, this was a great experience for me. Best of Show for this exhibit went to Eleanor McCain, for her piece "Sheep." Ah, back to the garden! My buddy Robin Schwalb flew in to help plant the garden in early May! She does this every year, if she can. Here she's putting in some of my saved marigold seeds from last year. She did a few, Sparky did a few, and I did most of the row, and the rascals didn't come up hardly at all. OR the cute little rabbits ate them down! It was a sad thing, weeks and weeks later, to have to admit that I would need to replant that whole outside row, the longest row in the Rainbow Garden. Grrrr. Now looking back, it's been replanted at least twice, as the dear rabbits had nothing much else to do this Spring but to munch my flowers. Aren't they sweet little critters? Hattie needs to think about bunny burgers more! Sparkle Plenty, aka Marykay Yannotti, came to our place the same week as Robin did this year, in order to attend the FAVA quilt show I had juried. You'll see we know how to get people enlisted! Make 'em feel competitive! Who can plant the best???????? Hattie calmly grazes nearby, wondering how she can get her hair to look like Sparky's. Can you imagine a magenta black lab? The exotic Pink Labbie! Very Barbie! Now, don't feel so sorry for Robin and Marykay, down on their baptist knees, digging in that dirt! We made sure to reward them with our Shacord Fiesta and homemade Margaritas later that night!!!!!!!! We know how to ease the pain! Mother's Day found Aimee, her son Omari, and me going out to West View Manor, to show two month old Omari to my mom. We were hoping she could somehow have a bit of recognition, at least that here was a cute little baby. But I don't think she picked up on it, certainly not the way she would have even a year or two ago. Alzheimer's is so terrible, and yet, at least she was there, and did give us some smiles and kisses and eye contact. I would like to tell you that she was playfully winking here, but it's just a coincidence, nothing intended by Mom. Or was it? You just can't know! But behold! Four generations of Shies! And then our Acord family went over to Canton, to Joe's Crab Shack, to celebrate Mama Wanda's birthday and Mother's Day. Her BD is May 11, and my mom's is May 8. They are the super-earthy Taurus Mommies! Here Mama Wanda's holding little Karlie, and Karlie's daddy, Jimmy's brother Freddie, is making faces at me! Now just look at that sweet little baby, who looks like her dad, doomed to make weird faces at people like that! Karlie was about nine months here. Isn't it amazing how all our families are loading up with yet another group of babies!!!!! Sure is weird, being middle aged! Sure don't feel like it, but here we are! But look at Mama Wanda! Isn't she a fox!?? She has the gift of eternal youth! One spunky Mama-in-Law! Here Robin is veiwing some of the quilts at the show. I am very proud of being asked to jury this year's show, and yet I feel that, considering that I had to jury out way more quilts than I put into the show, it was bittersweet work. Over 600 entries and 32 quilts in the show!!!!!! I hope you got to go see it, and that you liked it. If I juried your quilt out, I am sorry. I know how much it hurts to be juried out, and how vulnerable we all feel, being juried. I wish we coulda had a show of at least 300 of those quilts in Oberlin! Imagine hanging that show! They did a beautiful job of hanging this one, in a truly professional way, in a super gallery space. It's up til July 30, so you still have time to go! Back in Wooster, Robin got back to work on her quilt in progress. She's had great luck, starting quilts at our house that end up in Quilt Nationals. It's probably really that, not our garden and margaritas, that keeps her coming back to the middle of nowhere, when she could just hang out in NYC, like usual! This piece is another in her series of quilts about her trip to Russia a few years ago, in which she took lots of photos of surface textures of buildings, etc. Robin is the only person I know who loved the ugly patching streaks in the pavement on our street! All us neighbors complained for years and years, to finally get a new street surface. I told Robin that it's finally being redone, and she went into mourning! Textures rule for this chick! Since my computer hard drive needed to be reformatted, or initialized, and I could only think of jumping off a bridge, rather than trying that myself, Darrell Slaybaugh, from Services for the Visually Impaired, came and did it for me, while I watched and took notes. All the softwares had to be reinstalled. All the files had been backed up or were gone forever! Yikes! Darrell also installed more RAM memory into Tilly, and things got a little better for my little Mac. I've done other things to try to make it better since, and I'm going to upgrade the operating system, once this diary goes up, so I can upgrade all my softwares. With the 1997 Macintosh OS 7.5.5, I'm stuck in the obsolete category! Can't upgrade, unless you have at least system 7.6!!!!!!! And since Darrell's visit, Jimmy's turned into a computer geek long enough to replace the computer's battery and de-lint the mouse! Every little bit helps! Pretty soon Tilly's gonna be feelin' fine again! Meanwhile, we still get bombs and freezeups! After Robin and Sparky flew home, and before the May Turtle Art Camp, our friend Bella, Susan Marks, and her husband John stopped in, while they were moving from Berkeley to Madison, Wisconsin. Why not!????? It was fun to meet John and great to see Bella again! We had met her in 1998, when she came here for a camp, and had stayed in touch. Got a little garden action out of Bella, too!!!!! (Just dig a little here and here, and tell me what you think of my fine soil!) Here they're standing in front of Issie's Trailer Court, still in progress!!! And since they were moving out of Berkeley and our friend Paul Schmidt was moving from Wooster to Berkeley, we got them together. I finally got up my nerve to play a little guitar in front of Paul, who is REALLY GOOD! I haven't really played hardly at all for years and years. Ya only have so much time, and unfortunately, my work takes up most of my time now! Good thing I like my artmaking so much! But I just had to ask Paul to teach me a couple of songs, as long as they didn't involve bar chords, which I do not do! Actually the town Paul, Jody, and their kids moved to is Lafayette, not Berkeley. People from California know that this matters. Somehow. We really miss them! And then! Then! It was time for Turtle Art Camp with Barbara Randall of Lee's Summit, MO, Deana Hartman of Gardner, KS, Joy Loesch of Kansas City, MO, and Norma Sloan of Lantana, FL. What a wild week that was, this May! Above you see the partly made t-shirts we did with airbrush, under Jimmy's tutelage, for our camp, which got the name The Secret Cat Club. Each student and we make a mark, first on our own shirt, then on the rest - the same mark, freehand. It builds up and becomes a set of however many shirts we're doing. It's a great way to lose your fear of airbrushing! These were really classy shirts, too! See how stunning they are, worn by the proud artists!! Norma and I, front row, and Barbara, Deana, and Joy. Between Norma and me is the St. Quilta doll Norma made and gave to me when she arrived! Standing on a Barbie doll stand, this Saint is something fine to behold and pray to! Thank you again, Norma! She even put a lucky troll in the Quilta's garden basket! She knows my heart! We were so smug about these shirts we'd just made, we wore them to the fancy Wooster Inn for supper, the night we finished them! Fashion plates, we were! Some of the hot activities of this unique camp were: attending the Smithville All-Village Yard Sale; placing bets on the Preakness and awarding a kitty of useful and exotic art objects and supplies to the winner (Deana, whose horse was Red Bullet); having a challenge to make a piece entitled "Pickle Dish;" and thinking up rules for The Secret Cat Club. Whew! Oh, and of course we did the usual thing of late night shopping at Wal-Mart, with me selecting a challenge fabric to gift my campers with! It was a stunning hot colors sunset number, and we all clumped it together with the "Pickle Dish" challenge to make some great statements! We also had TWO birthdays during this camp! Norma's birthday was May 20. The rest of us decided to make her a pillow front out of fabric, using fabric markers, and did this piece after she had gone to bed. It's a turtle as a birthday cake, walking sideways, and the Beatles as sea monkeys, using the turtle's shell as a stage. Natch! It was one of our most creative projects. Laughed so hard, our sides hurt! Also, Barbara baked an apple danish cake kinda thing, to be Norma's birthday cake. Then, two days later, it was Joy's birthday, and we angsted that perhaps we couldn't achieve such high artistic excellence yet again! But behold! We did! We made Joy go to bed early, and once again, we attacked a piece of white fabric with fabric markers! This time we were inspired by Joy's fabric pickle she'd made for the Pickle Dish challenge. We sort of swiped the actual piece, but only safety-pinned it to our art, so she can have it back. The pickle became Mick Jagger's tongue from the Rolling Stones' logo of the big tongue and lips. We figured we should do the Stones this time, instead of the Beatles, to give them equal time. But we did throw in one sea monkey, wearing a crown, so he musta been the King of all Sea Monkeys! Pretty fine, eh? And Deana baked Joy a german chocolate cake! By the way, these campers made the sunglasses-wearing tomato pincushion kinda thing, at the top of this diary page, which sits on the shelf above the stove in our kitchen! It was a planter Norma found at the Smithville Yard Sale. They stuck a piece of a wool sweater in it, covered with fabric, and made it into a giant pincushion for me! Now, THAT is creative, folks! Here's a piece Jimmy was working on, during that camp. It's a case made especially for a man Jimmy did an antique flyrod swap with. Harris Angell, who runs Angell's Antiques in Delaware, OH, has these two parrots flying around his wonderful store! Jimmy put them on the front of the case, and Harris' dog on the back. Like Jimmy's fly fishing equipment cases, this one is all custom engineered and hand tooled, not stamped. Each mark on the birds is made one tiny stroke at a time, being pounded in with a mallot over a long time and process. Then he hand dyes the leather, hand paints the image, and does all the sewing with an awl and needles, not with a sewing machine. And he has no purchased patterns to go by. My baby's a genius! He's my Pickle Dish! We got a little garden slave labor out of Deana during camp, but couldn't really expect campers who'd come to make art, to want to throw themselves into the service of Doris the Scarecrow! After they went home we got back to the garden effort in a big way for a few days, spreading more mulch on between planting rows. Here's Jimmy, using a pitchfork. I'm more of a hands on kinda gardener, and later I spread new straw over all this stuff while he was fishing in Michigan. I would just grab the mulch one flake at a time, and pull it apart and tuck it down carefully. Jimmy'd gotten me six new bales before he left, and I used four of them. The last two will be used up fast, once the plants get big enough to tuck the mulch up close around them! Then I can back off on watering and weeding! I can't wait! I love to plant, transplant, weed, water, etc, but it does take up a lot of art time! I think we're finally entering a slowdown period, when you wait and see what really turns out, not being eaten by rabbits, ground hogs, or bugs. Gypsy Moths are coming. I wonder if they like different greens from the ones rabbits eat. I try to not grow what the critters like. It's been a real education, over the years! Go to Page Two of this same diary, to continue. Thanks!